Molokans | The Happy Wonderer ~ ellen b. Today for Tuesdays With Moisi I wanted to give you some information on the Molokans, Moisi’s religion before he was born again. 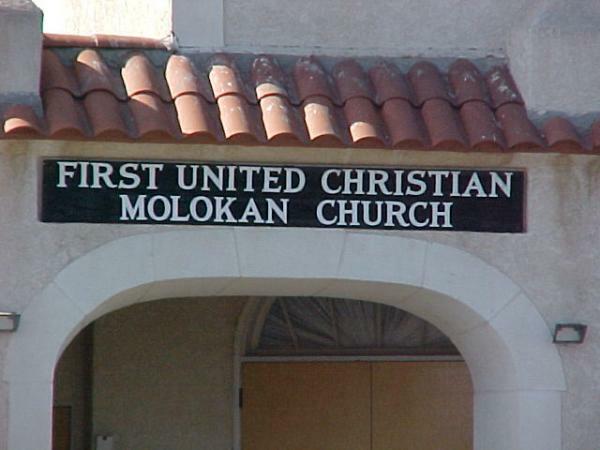 I have some previous posts about the Molokan Cemetery in City of Commerce, California and the Molokans (Milk Drinkers). By sharing these posts I in no way am promoting the Molokan Religion. Some of the traditions are noteworthy but not to be worshipped. I’m adding some photos I have of Molokan events and the Molokan churches in Los Angeles and San Francisco. The photo above is a wedding photo. This is our uncle Vasili’s (Bill’s) marriage to Nura. Our parents are the chaperones who stood with them for the wedding ceremony. This photo would have been at the bride’s home where the groom comes to pick up his bride from her parents to ride to church with the chaperones for the marriage ceremony and meal. At the bride’s home prayers are given as a blessing to the couple. This photo above and below are not my photos. 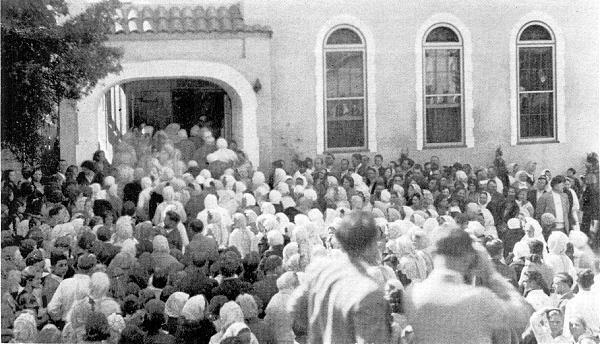 Above shows the dedication day of the new United Molokan church in Los Angeles (Big Church). The photo above is a photo of a Molokan church on Portrero Hill in San Francisco. Some of our families good friends settled in San Francisco and attended this church. Very minimal interiors are part of the Molokan churches. A main table that have had different objects on it. A Bible, Salt and a loaf of bread. Some churches add a book of prophecy. We have heard that one of the small radical Molokan churches in Los Angeles have taken the Bible off their table. Benches are what are used for seating. The male leaders sit at the head and far side of the table. Others sit on benches a distance from the table. Men on one side and women on another side. For meals which are a large part of the church they use benches again and saw horses with flat 4X6 ish planks of wood for the table top that rest on the saw horses. You’ll see an example in the videos below. Long rows of those tables with the benches fill the whole inside of the building and food is passed down the table for the group meals. 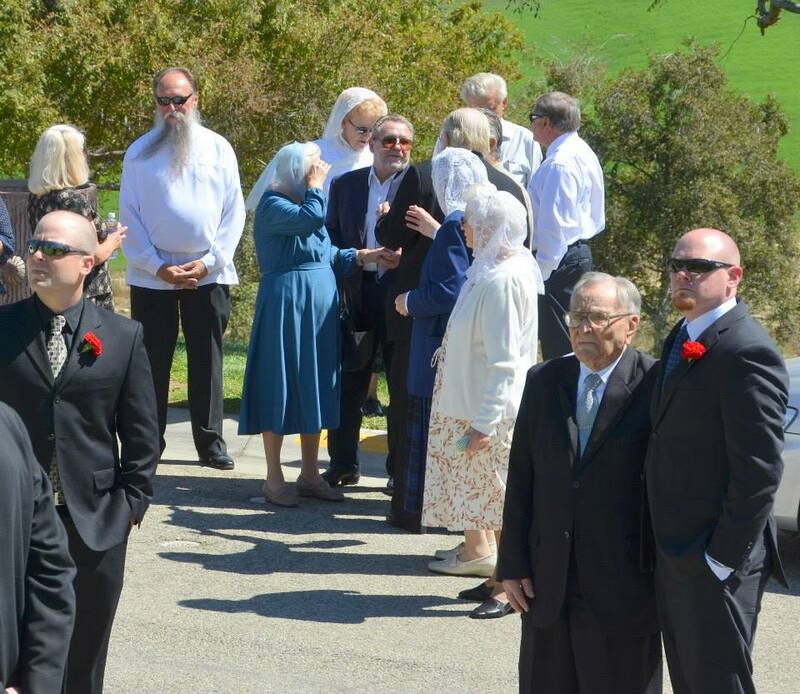 In the background of the photo above is a small group of Molokans who came to our mom’s funeral in 2013. Our Pop, Moisi, is standing with our nephew Ryan. The YouTube videos below are a sampling of what the singing is like in Molokan churches. To my knowledge there are two distinct groups of Molokans. There are the postoyanniye, “constant”, original Molokans who wanted to keep their distinction from the “Jumpers”. In 1833 there was a breaking away of a portion of Molokans who experienced what is described as an outpouring of the Holy Spirit. This outpouring resulted in men and women in the church service at different times jumping. Spiritual Jumpers, pryguny, are the group of Molokans our Pop and his family were part of. The Russians in San Francisco are part of the Constant sect and they don’t jump. Again to my knowledge there are two “prophets” associated with the Jumpers. One is Maxim Rudometkin. His writings are followed by the Spiritual Molokans of Los Angeles (Big Church). Some of these Molokan Jumpers called themselves “New Israelites” with their leader Maxim. They follow old testament dietary laws and also celebrate the feast days, holy days, festivals but they gather on Sundays as their Sabbath day. The group, also known as Maximists, considered Efim Gerasimovic Klubnikin, a divinely inspired 12 year old boy prophet. 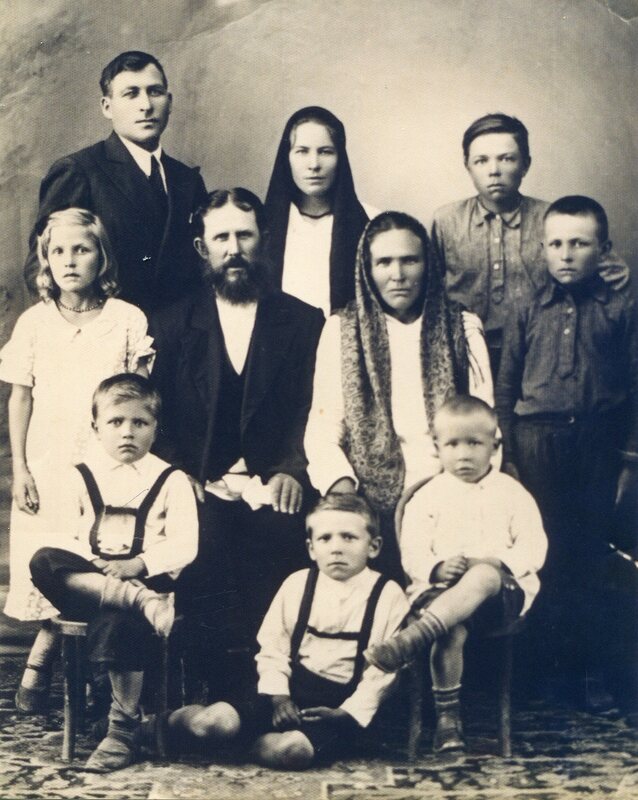 He prophesied a “coming time that would be unbearable and that the time to leave Russia was now.” During the early 20th century under his leadership, about 2,000 pryguny (Jumpers) emigrated to the U.S., first settling on the east side of Los Angeles. Many seeking rural isolation moved to Baja Mexico, then Arizona, Central California, and some other parts of the West Coast. We visited a few Molokan families on their farms in Kerman, Calfiornia. Maxim’s writings are published in a book that is kept on the central table for worship along with a Bible and the song book. This was the first church we attended before our pop along with some of his relatives and friends started a Molokan church of their own on Kern Avenue in Los Angeles. The Kern Avenue group celebrated Easter and Christmas but First United Christian Molokan Church (Big Church) did not celebrate these holidays. Our grandfather, Timofey, and our uncle John stayed at Big church and were leaders there. 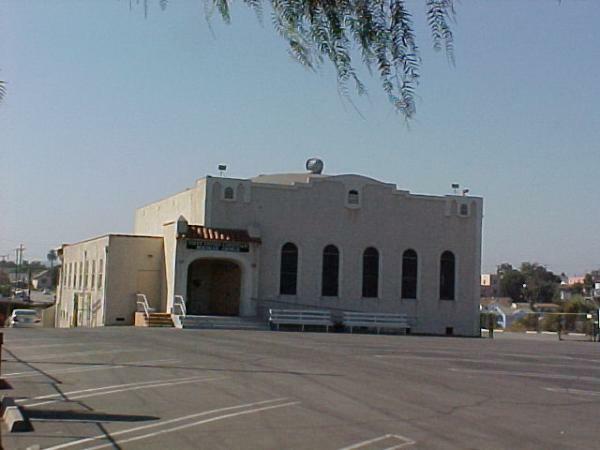 Our brother Fred got married at Big church and is still part of this church but it has relocated to La Habra, California. When we attended church here there wasn’t a paved parking lot. 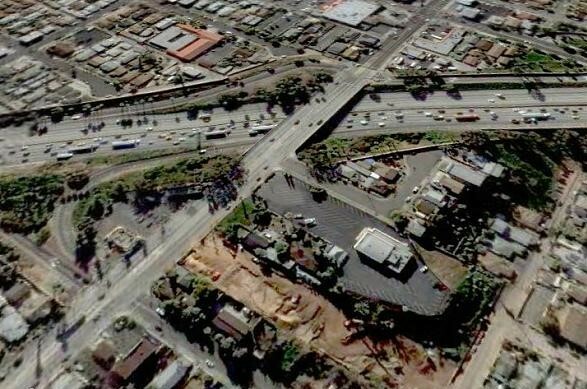 Another change from when we attended “Big Church” is the addition of the 60 Fwy in Southern California. It cuts pretty close to the church property now. 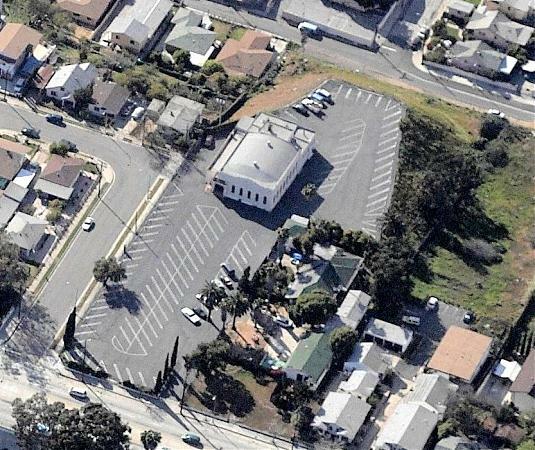 This property has been sold and this church group now meets in La Habra. My favorite part of being a Molokan were the meals we shared at those rows of tables along with hot tea. Sugar cubes were set on the tables in small bowls. We kids would always build a bridge of sugar cubes across the top of the tea glass then pour the tea and hot water over them and watch them collapse into the glass. In the videos you might see that glasses and bowls are still used to serve tea. The meals consisted of either Borsch (cabbage vegetable soup with beef stock) or Lopsha (noodle soup). Bowls of whole cucumbers and tomatoes would be passed down the tables and one person would take the knife in the bowl to peel the cucumbers and slice them and then slice the tomatoes and put them back in the bowl. Fresh bread was served with the salad and soup. Then the meat and potatoes that were used to make the broth would be served. I can almost smell the meal and that fresh bread and fresh cut salad. Delicious. 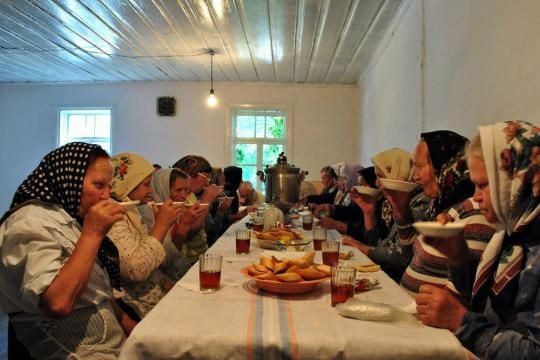 In google searches of Molokans I came across a great article out of Russia about their history. I will share more on another Tuesday. This is our Pop’s story dictated verbally by him a few years ago. I’ll be sharing excerpts every Tuesday. When I add to his story or explain a photo I will Italicize my words. Our Pop’s words will not be italicized. Our mom does not come into Pop’s story until “Tuesdays With Moisi ~ 9” even though I’ve posted photos of her before #9. I have very few photos from our parents’ life in Russia and Persia. At the end of my Tuesday posts I’ll add links to all the other posts. 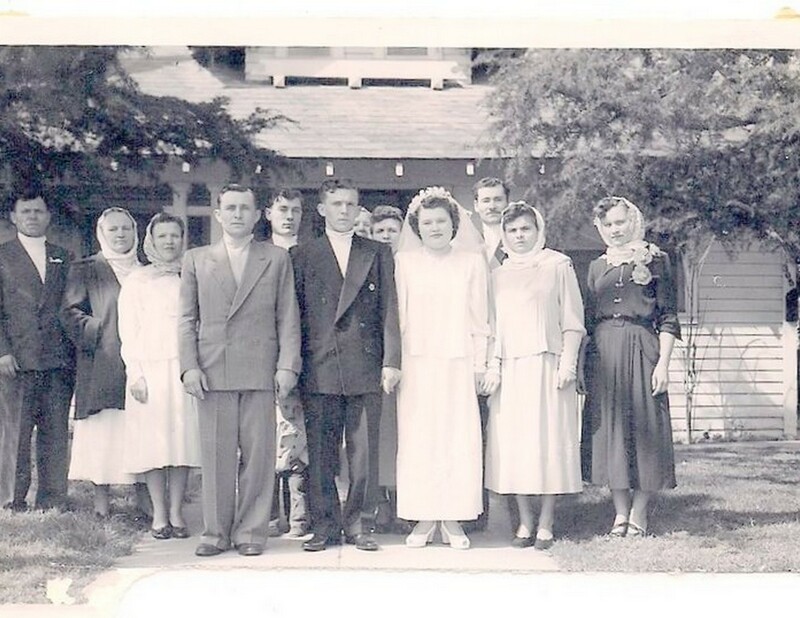 Our Pop is the boy on the right standing next to our paternal grandmother babushka Martha. 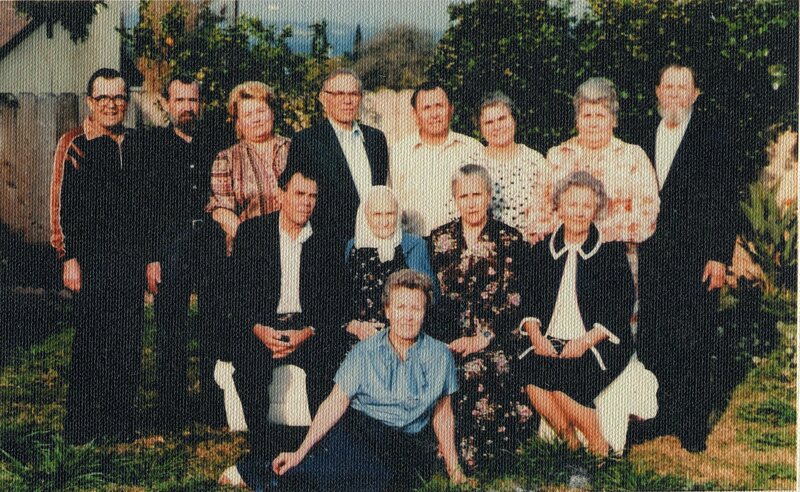 Our Aunt Anna who is the one remaining family member alive is on the left side next to our paternal grandfather Timofey. My name is Moisi Timofeyavich Bagdanov. The name Moisi is the anglicized version of Moses. In the Russian language it is pronounced as Moses. I list my birth date as May 25th, 1923. I’m sure of the year but I’m not sure of the actual day of my birth because I was born at home and no records were kept in those days. All that I know was that I was born sometime in May, according to my mother. We lived in a village called Saleem in southern Russia about 200 miles south of present day Rostov. Our village was in a network of about 30 other villages mainly inhabited by Russian Molokans. And that is who we were. I was born into a large family – twelve children altogether – and we never seemed to have enough of life’s necessities. My earliest memories involve my cousin Michael and me. We were inseparable playmates. One day we went into the fields where watermelons and cantaloupes were growing. We had a knife between us and so decided to check out how the fruit was ripening. I very much remember the verbal tongue lashing I received as a result of our informal field testing! Another time I remember being chased from my grandfather’s bee hives because of the mischief we were causing there. In the spring of 1928, at the ripe old age of four, I was placed on my first plow horse and thus began my career in farming. In the spring of 1929 I remember the agricultural advances that were made when our village and two others invested in a tractor, threshing machine, and a combine for the wheat harvest. By today’s standards they would be very primitive, but at that time they were a godsend. The whole village participated in the harvest with singing and gratitude because of these labor saving devices. I also remember a very small dairy near our village which produced cheese, cottage cheese, and butter. We kept these products from spoiling by packing our underground cellars with snow in the winter. We poured water over the snow turning it to ice. That small cellar served as our refrigerator for the entire year. 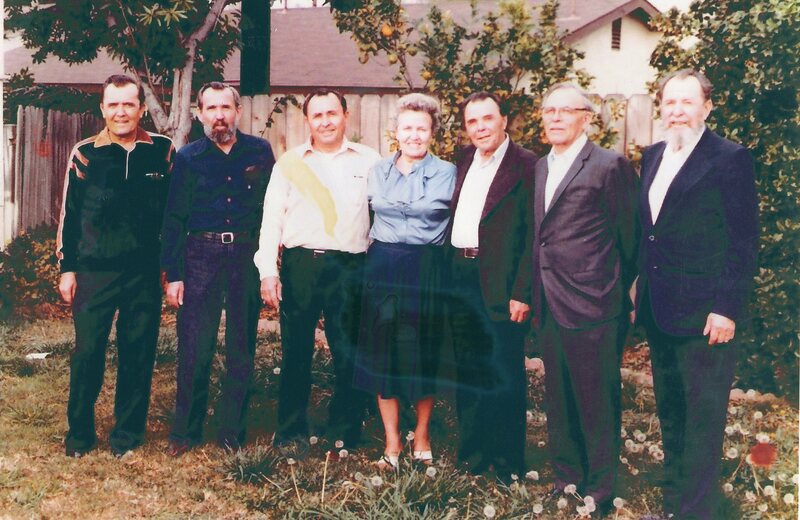 (Seven of the 12 siblings remaining together in the USA in 1982. Jim, Vasilli, Pop Moisi, Anna, Mikhael (Mike) who was visiting the U.S.A. for the first time, Alex, and John.) The next photo has the spouses added. Aunt Anna’s husband was deceased already. Uncle Jim was divorced. Mikhael did not imigrate to the USA like the rest of these siblings in the photo. After escaping to Persia with the family and living there for several years he heard things were better in Russia so he returned. He was immediately arrested and sent to Siberia. Miraculously he survived his time there. He applied to visit the U.S.A. many times and was finally granted permission in the early 80’s when these photos were taken. The U.S. family had not seen Mikhael for 40 years and this visit was such a happy reunion for everyone. When my parents took their trips to Russia and then returned as missionaries to Russia in the 90’s they were able to have many good visits with Mikhael and his family. 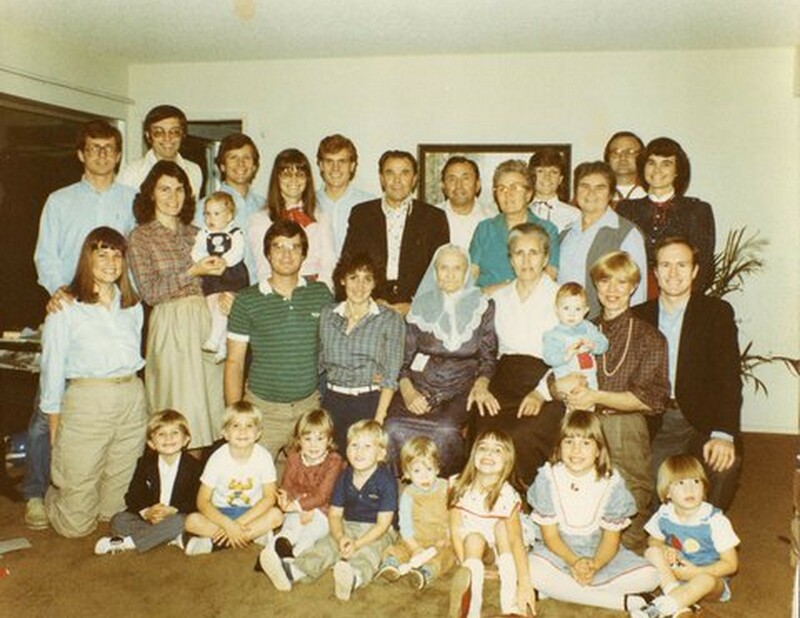 Uncle Mike center top row next to Pop(Moisi) and sister Anna with babushka Martha (Moisi’s mother) sitting in front of them. All my brothers and sisters. Six of us were already married in 1982. Leonard and Lana, the twins were not married yet. Several grandchildren and great grandchildren not born yet. Moisi’s kids, my brothers and sisters and me are in bold print. Some details and history about Molokans from an earlier post of mine can be found here. Photobucket is holding all my photos from 2007-2015 hostage and demanding a ransom for me to access them. I’m slowly cleaning up many of my posts where PB have added ugly black and grey boxes where my photos used to be. So frustrating! Happy March everyone and because Easter is just 22 days from today I wanted to post the recipe I promised for my mother’s Russian Easter Bread, Kulich. The big question is…will ellen b. finally attempt making it this year??? We’re off for our beach walk and had a very busy day yesterday so I hope to get around to blogs later and a post about my Friday. I promised my mom’s recipe for Kulich. Now what you need to know about my mom and recipes is that she ends up tweaking them from year to year so this recipe is the last written down recipe for her Kulich from 2001. Add yeast to the cup of water and cup of milk. Make sure the liquids are lukewarm. Let this mixture dissolve and sit. In the meantime beat the eggs, only use a stainless steel bowl. (because mom says it will work better that way). Now add the 1 T. of sugar into the yeast mixture and stir to dissolve. Cream the butter and sugar. Add the eggs to the butter and sugar mixture and mix to combine. Mix the half and half with the whipping cream and heat until lukewarm. Add the half and half mixture to the eggs. Mix in the vanilla and brandy. Add the yeast mixture and the salt and beat with a mixer. Continue beating and add the lemon zest. Continue beating and add the flour about a cup at a time. Once you cannot beat the dough any longer, put the dough on a floured surface and start incorporating the flour by kneading the dough. The dough should be kneaded very well approximately 10 minutes. You should knead the dough until you can cut it with a knife and it is smooth without any holes. Place the dough in a stainless steel bowl. Take some oil and pour a little on the dough and spread it all over the dough. Make sure to turn the dough so it is coated evenly. Cover with plastic wrap right on the dough and a dish towel on top of that. Place in a warm place away from drafts to rise. (My sister usually puts it into the oven that has been warmed slightly. It is now time to prepare the coffee cans (1 lb. and 2 lb. cans are the best) Cut circles the size of the bottom of the cans out of wax paper. You will need four circles per can. Make sure the cans are well greased. Put the 4 circles in the bottom of the cans. Use a empty and clean coffee can like the one above. Take the label off. You’ll need to use a can opener to cut the lip off the can. I hope these pictures will make the process easier to understand. Cut sheets of wax paper long enough to line the sides of the can and tall enough to be 2″ above the rim of the can. Use crisco to seal the ends of the paper. Here’s a can with the bottom and sides lined with the wax paper. When the dough has doubled in size, punch it down and turn it over. Let it rise a second time until it doubles in size. Punch it down again. You will take a portion of dough about 1/3 the size of the can. Knead it and form it into a smooth ball that you can easily drop into the can. Let the dough rise again inside the can until it is at least double in size. Bake in a 350 degree oven until golden brown on top. Let them cool slightly in the cans. Remove them from the cans and then cool completely on their sides. Cover them with a towel and turn them several times so they keep their shape. To go with this bread my mom always makes a wonderful sweet cheese topping that is formed in a mold in different shapes. For my mom’s Sernaya Paska (cheese spread) recipe click here. Happy Birthday Little Brother! 50 Years Young Today! Talk about a blast from the past. Look at the cousins around this table. The Loscutoff’s, The Bogdanoff’s, The Shvetzov’s and the hosts of the event the Bagdanov’s. 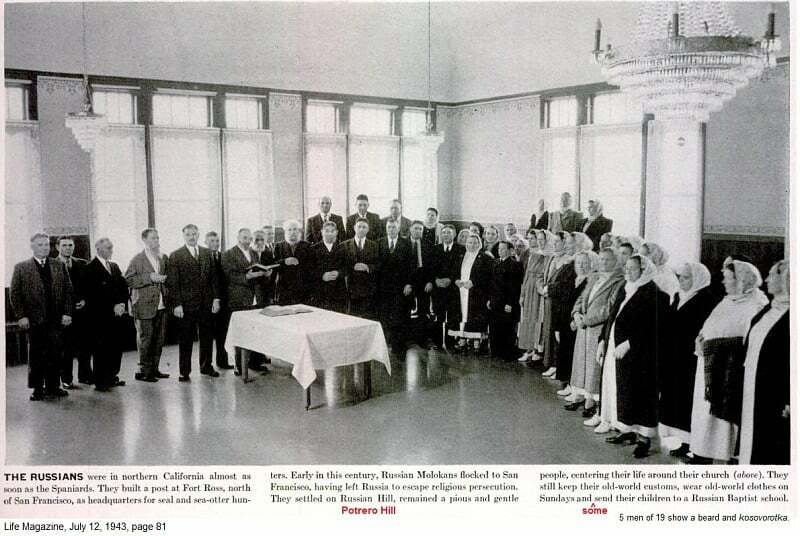 I wish the photo clearly showed Dedushka at the end of the table sitting next to Pop. Look at you so pleased with your cake! Here you are in a classic 50’s highchair enjoying your cake with Mom watching. Spring forward to the present! It was fun celebrating with you and Letty at the California Grill in Camarillo on Saturday night. Photobucket is holding all my photos I stored with them from 2007-2015 hostage. They have blacked out all those photos on my blog posts. OH BOTHER! I’m slowly cleaning up my posts. The Ladies got together to make Vareniky together at my niece Debbee’s house. Look at those cute aprons on Michelle, Melissa, Debbee, Letty, and mom! I want to say at the top here that this recipe is for a lot of vareniky. So you’ll need to do the math and cut it down. This recipe makes about 40 or 50. Update! sorry peeps! I forgot the Salt…you’ll need to add 1 Tablespoon of salt to the dough, also. Sift flour. Make a hole in the center of the flour. Combine eggs, half n half, sour cream, salt, and sugar. Beat until combined. Pour into the hole of flour. Mix and knead adding flour until dough stays together. Dough will be very soft. Beat all ingredients together until combined. Roll out flour mixture. Cut circles about 3″ in diameter. Put about 1 heaping teaspoon of the cheese in the center of the circle. Fold in half and pinch ends together then flute with finger. Place the vereniky in boiling water until they come to the surface and float. Drain and cool. At this point they may be frozen. This is what they are suppose to look like. Just remember this one was made by a pro! That’s the cheese mixture in the bowl that you fill them with. This is the boiling step. 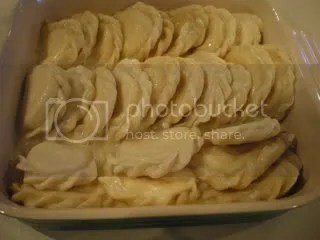 To serve, place vareniky into a 9 x 13 baking dish. Melt one cube of butter and pour over vareniky. Heat up half and half and cover the vareniky with the half n half. Bake at 375 degrees until the half n half boils. Serve with sour cream and preserves or syrup. My family traditionally has these for dessert on Christmas Eve when they get together. They are also a favorite for breakfast. The joy of receiving and eating these treats is always wonderful. I’m going to have to be in L.A. for one of the cooking parties so I can really learn how to make them and enjoy them in the future! Today we got word that our cousin Vera Bogdanoff had died of complications from an aneurysm she had a few months ago. She was progressing well but had complications from an infection two days ago. Alex is my father’s nephew, my cousin. They were Molokan like my dad but left the Molokan church years ago to follow Christ more earnestly as did my parents. Vera was one of my relatives on my dad’s side that I could relate to and enjoy whenever I was around her. She will be missed dearly. They moved recently to Texas just before she had her aneurysm to be close to one of their daughters. My parents were just in Texas over Thanksgiving visiting my brother and his wife and they all were able to go to the convalescent home and visit her. They sang songs in Russian to her and she cried and mouthed some of the words with them. It was a sweet time. This is a photo from 52 years ago on their wedding day. They were married in the Molokan church. It is the Molokan tradition that the groom and his extended family gather on the day of the wedding for a blessing and then go to the brides family home to pick her up (this is where the bride leaves her mother and father and clings to her husband) and go to the church for the wedding. There is always a married couple chosen to be the bride and grooms chaperons/escorts (best man and maid of honor type deal) My cousin Alex is in the middle of this photo flanked by my Uncle Bill and Aunt Nora who were his chaperons. I’m the littlest one on the front row with the coat on surrounded by my siblings and cousins. My dad and mom are next to my Aunt Nora in the back. Molokans still dress like this for church, weddings, and funerals. My parents will be flying to the Dallas area for the funeral. We know that Vera is with her Savior and rejoicing. We are praying for her 2 daughters and son-in-laws, grandchildren and her husband, my cousin Alex who will miss her dearly. Photobucket has blacked out all my photos I was storing on their site and they are holding them hostage. I am working on updating my more than 4000 posts.